Sybrina Fulton, mother of Trayvon Martin, has sent out a statement retracting comments she made on a 'Today Show' appearance. Earlier today, I made a comment to the media that was later mischaracterized. When I referenced the word ‘accident’ today with regard to Trayvon’s death, in NO way did I mean the shooting was an accident. We believe that George Zimmerman stalked my son and murdered him in cold blood. The ‘accident’ I was referring to was the fact that George Zimmerman and my son ever crossed paths. It was an accidental encounter. If George Zimmerman hadn’t gotten out of his vehicle, this entire incident would have been avoided. My son was profiled, followed and murdered by George Zimmerman, and there was nothing accidental about that. Ms. Fulton made an honest mistake and maybe this is a lesson as to why the family may want to stop talking to the media for a while. I'm sure they are weighing their legal options as to a wrongful death suit against the city of Sanford and the more they talk the more they are likely to mis-speak (I know that's not a word) or be taken out of context. It's better if the family would stop talking to the media because, in cases like this, the persons involve or related should be careful with they are saying since it may used against them in court. These are strong statements made by Miss Fulton. The prosecution lawyers should start looking on the angle that Martin could have been actually profiled and followed by Zimmerman prior to the incident. The family should stop talking to the media because, in cases like this, the people involve or related should be take extra careful. She might have been too carried away that strong statements came out of her mouth. This might be hard to take back now. She should have let her attorney do the talking as he would be more experienced on what to say. 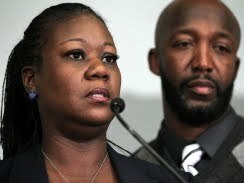 Trayvor Martin's mom should speak of vindication now that Zimmerman might end up spending his lifetime in jail. An expert wrongful death attorney Los Angeles friend of mine thinks this kind of case is sensitive especially that racism is one of the issues involved.